It’s Super Bowl Sunday, and that means snacks and dips. 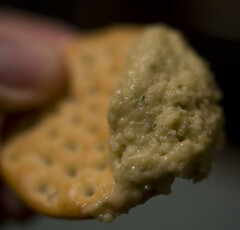 I already shared a simple Hummus recipe, today I share an even simpler dip. I used to just call it Rotel, because it was Rotel and Velveeta. I loved the combination, and first encountered it over 25 years ago (ouch… I am old). It was a stand by. My only knock on Rotel wasthat it wasn’t really hot enough, and it’s a little to thin for my taste. They fixed the first problem by coming out with a Hot variety, but I still found the liquid to solid ratio to be less than ideal. 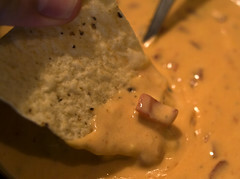 It yielded a Queso Dip that was a little too runny for my tastes. Since abandoning Rotel, I needed a new name. So I am trying Queso Producto con Tomate y Chiles Verdes, or Cheese Product with tomatoes and green chilies in Spanish (I think). Maybe I’ll just stick with Queso Producto. We are coming up on Super Bowl Sunday, which means snack time. I have two snacking ideas that are essentially diametrically opposed to each other. I am going to start with the healthier of the two. I do like to occasionally eat something relatively healthy, and Hummus is one of my go-to good snacks. For me, Hummus is essentially a garlic delivery system. It consists of garbanzo beans, tahini, olive oil and some garlic for flavor. That’s not to discount the importance of the lemon juice and parsley. The original version of this recipe came from… well you could probably guess… a Good Eats episode. In this episode, AB was focusing on easy recipes from the pantry, that involved beans. The original is available on the Food Network website, and is called Turbo Hummus. My only modification is to change the Peanut Butter back to Tahini. It would be interesting to try this with peanut butter.